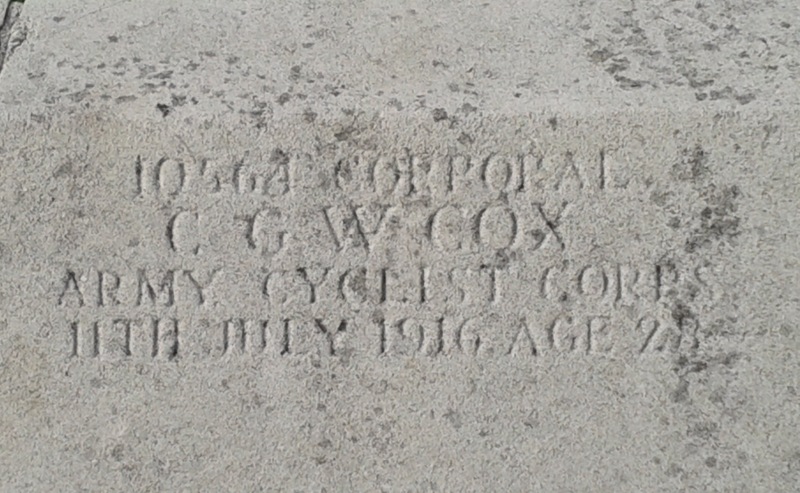 I first noticed the name of Charles Cox of the Army Cyclist Corps on the WW1 memorial on the Lewisham side of Brockley and Ladywell Cemetery several years ago. At the time I was reading John Foot’s excellent history of Italian cycling ‘Pedalare! Pedalare!’. 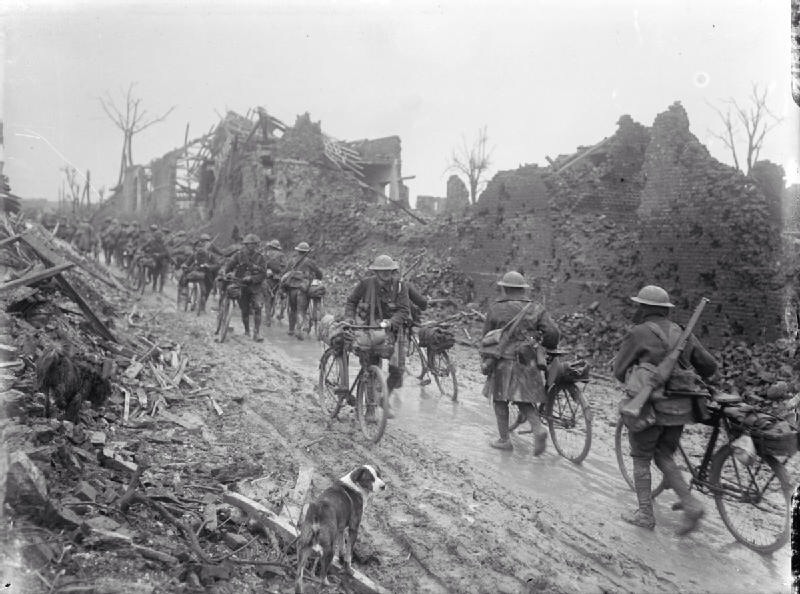 This included sections on cyclists in WW1 – including the amazing tale of the one legged Enrico Toti, and in WW2 where Giro and Tour de France winner Gino Bartalli used his cycle to smuggle false papers allowing Jews to escape from Mussolini’s regime. I was unaware though of their World War 1 British counterparts, and it got me interested. The main role of the army cyclists was patrolling the coastline. Some units were sent into active service to provide reconnaissance and communications support. However, they tended to be ineffective in trench warfare and spent much time trench holding duties and manual work. There is a Wikipedia photo below of them in the Somme in 1917. 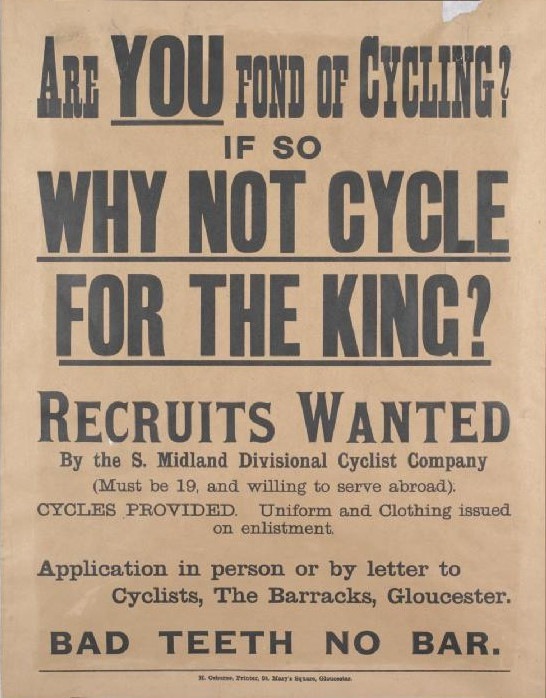 There were some very specific recruitment posters for them, the last line of one in Wikipedia makes me smile. As for Charles George William Cox, he was born in Bermondsey and later moved with his parents to 78 Alloa Road in Deptford. By the 1911 census, he was a postman living in West London with a manager at the sorting office who was also a Bermondsey boy – perhaps he had helped him get the job which oddly had to be listed in the London Gazette. He married Elizabeth Caroline Brown in December 1911 in Brentford. By the time he enlisted, Cox’s address was given as 2 Benbow Road in Hammersmith. Which regiment he was in remains unclear – he enlisted in London, so it is likely to have been one of the three Kent Battalions. Their role was, initially at least, one of ‘guarding key points and patrolling the coastline to deter invasion and catch spies’. Charles Cox was listed as ‘B Company’ which was based at the Training Centre in Tonbridge. How he died is unclear, it is possible that he might have been posted to India and was wounded in action – the First Batallion was stationed there from early 1916 onwards – or it could have related to injury or illness in Britain. Where he died is also slightly unclear, one of his army records suggests that he died at home in Forest Hill, but ‘home’ would presumably have been either Bembow Road or Alloa Road, although it is possible that his parents had to move during the war. If he died in Forest Hill it could have been that he was at one of the auxillary WW1 hospitals, the Fairlawn, in Honor Oak Road. Wherever, he died, he died young, at the age of 28, and when in the cemetery I always go by the memorial and pause for a moment by the inscription of his name. 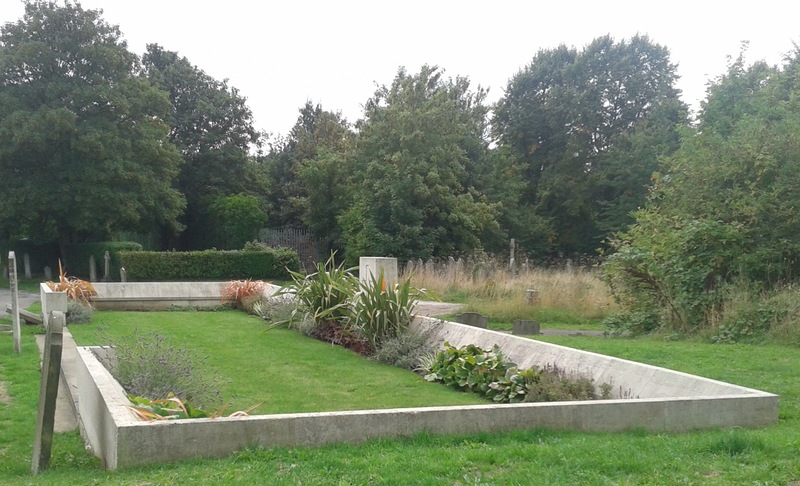 This entry was posted in Cemeteries, Lewisham History, War Memorials and tagged Army Cycling Corps, Brockley & Ladywell Cemetery, CGW Cox, Charles Cox, WW1 on August 27, 2014 by Paul B.